Galt Museum & Archives receive First World War Medals from the family of Japanese Canadian solider. 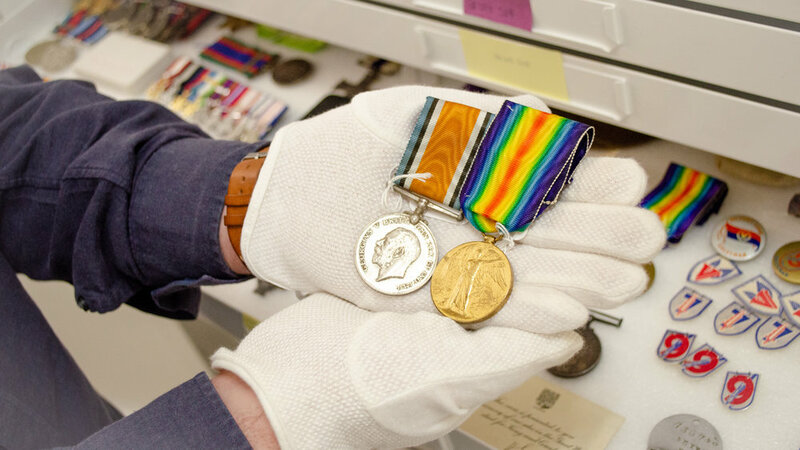 Lethbridge—Kevin MacLean, the Collections Technician at the Galt Museum & Archives was extremely excited when Pat Sassa approached him about the possibility of donating a set of medals from the First World War that were awarded to her father Tomomi Okutake to the Galt’s collection. Receiving any objects related to the First World War is a rare occurrence, but the story that these medals uncovered supporting Japanese Canadian contributions to Lethbridge and southern Alberta in the early 1900s is even more invaluable to the community. MacLean stresses that finding any tangible connections to the Japanese Canadian participation in the First World War scarce across museums and archives in Canada, because only 222 Japanese Canadians enlisted to serve in that war. Having artifacts at the Galt with connections to the community makes this a particularly meaningful part of our collection. Part of the challenge of establishing the heritage value “fit” of war medals and objects is ensuring that the person who served in the war was resident in the community prior to their enlistment. The Galt’s research indicated various potential sites of residency prior to Okutake enlisting to serve, ranging from Calgary to Vancouver. MacLean and his staff worked hard to ascertain that Okutake was indeed resident in Lethbridge prior to enlisting. “It’s critical that we are certain that he was residing here in order to house these objects because if he were not, then his contributions to the war effort relate to another community.” MacLean and his staff used military records, history books, obituaries, and an oral history interview with Okutake’s late spouse Tsuru Okutake from the 1970s at Simon Fraser University to pinpoint Tomomi Okutake’s residency. Using a combination of evidence from a variety of sources, they feel confident that Tomomi was resident in Lethbridge prior to enlisting. Because of the significance of this donation to the collection of the Galt Museum & Archives in expanding our repository of objects and stories related to the First World War, to the Japanese Canadian participation in the First World War, to the Japanese Canadian story in southern Alberta, and to the Okinawan people within the region’s Japanese Canadian community, we are holding a press conference on November 9, 2018 at 9 am at the Galt Museum & Archives. We will have our Collections Technician and descendants of Tomomi and Tsuru Okutake, including medals donor Pat Sassa, on hand to speak to the meaning of the objects that were recently donated to the Galt.